In a world enthralled by film, special effects and virtual reality, there is still something powerful about the impact of a still image. The story embodied in a single photograph, a moment frozen in time, is a unique experience. At the Natural History Museum in London we are proud to produce Wildlife Photographer of the Year (WPY), a competition that champions nature photography as an art form and gives a different voice to the natural world. Now in its 54th year, the competition continues to showcase photography that reveals the diversity, the beauty and the fragility of life. Starting out with just 500 entries, the competition now attracts almost 50,000 entries from amateur and professional photographers across 95 countries. The winning entries are seen by millions all over the world. The growth of this phenomenon suggests that even in this modern age, we still crave a connection with nature. Today, on a planet that is groaning under the pressure of human impact, WPY serves as a much-needed reminder of our complex relationship with wildlife. While some images convey the stunning beauty of our planet, others remind us of the formidable threats faced by vulnerable species along with the shocking magnitude of human cruelty. This juxtaposition poses a difficult question. If we wish to create advocates for our planet, is it better to showcase the wonder of our natural world or reveal the raw truth of human’s impact on the environment? Do shock tactics result in in change, or does revealing nature’s beauty motivate us to care more? WPY crosses this divide, and I have selected seven photographs from amongst the world’s greatest wildlife photographers that provoke different reactions. As you view them, assess for yourself your reaction and contemplate what it takes to raise awareness and action for nature. Plastic and its infiltration into every part of our planet has become a global concern. ‘Sewage Surfer’ by Justin Hofman is a stark reminder of this wide-reaching impact and particularly on its smallest inhabitants. Seahorses are poor swimmers due to their equine shape so they propel themselves forward using their wing-like dorsal fins, with their smaller pectoral fins used for steering. It’s exhausting work, so they often catch a ride or take a break by clinging to sea grasses and corals with their prehensile tails. 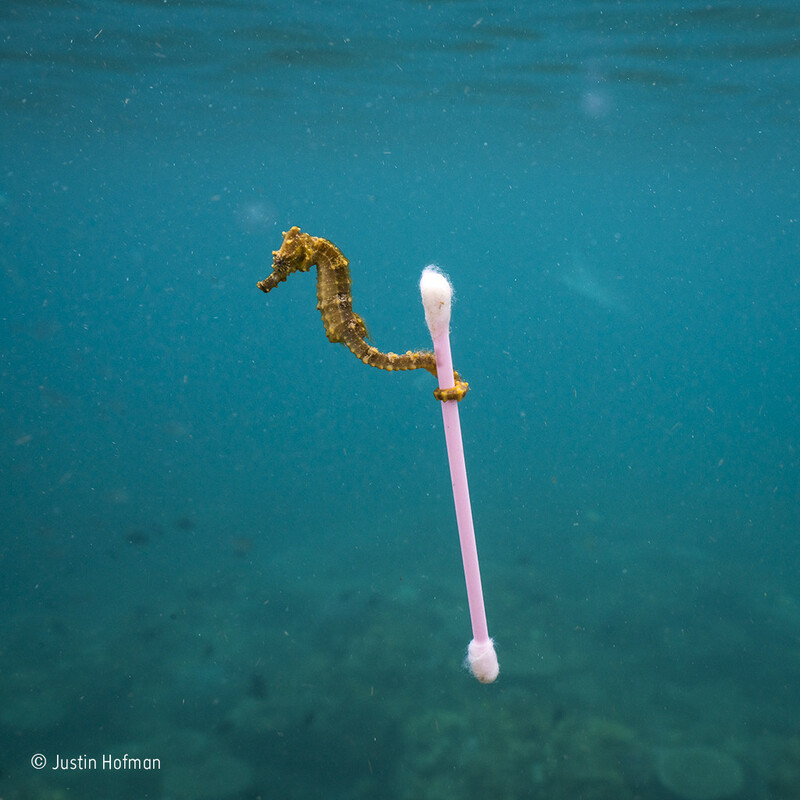 Here, the association of the seahorse grasping a cotton wool bud makes this both a memorable and disturbing sight. So poignant in fact, that this image went viral. From environmental damage to human cruelty, some images can only shock and evoke outrage and empathy. Looking into the eyes of this imprisoned sun bear, in Emily Garthwaite’s ‘Witness’ it is impossible not to be overwhelmed by emotion. The bear's desperate situation in an Indonesian zoo was captured on a trip to Sumatra where sun bears, the world’s rarest bears, are commonly exploited for their gall bladders and bile. 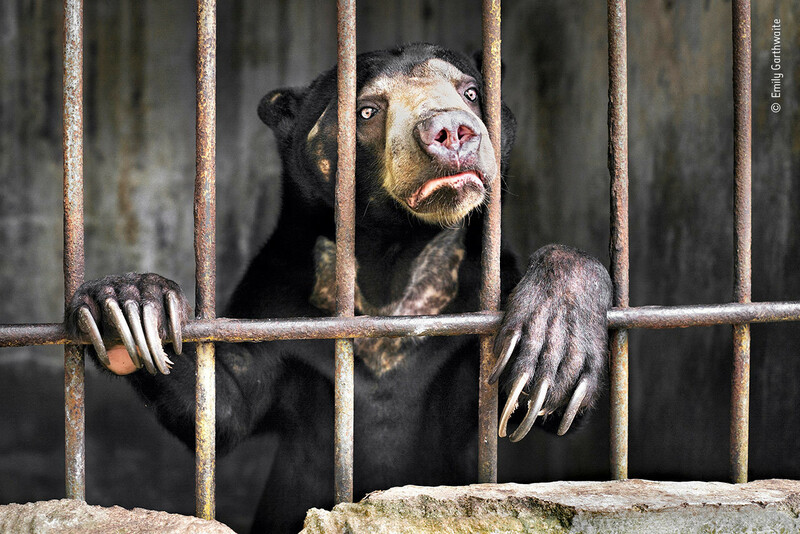 Difficult to look at, the sun bear, rarely featured by the world’s media, is given a voice through photography. Emily has since used this WPY-winning image to work with anti-animal trafficking organisations to protect sun bears and other animals in captivity. When faced with seemingly relentless stories of animal cruelty, ‘Saved by Compassion’ by Adrian Steirn gives glimmers of hope for a more caring future. 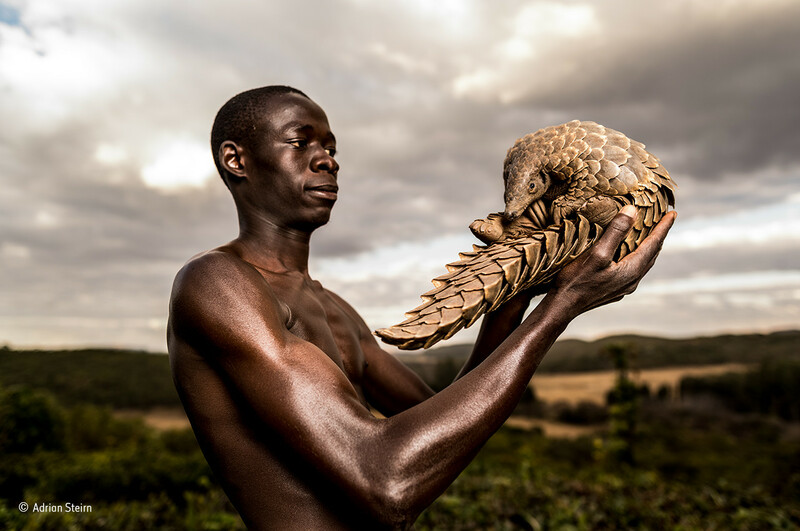 Recovering after its confiscation from poachers, the pangolin featured in this striking portrait is one of the lucky ones. In spite of a global ban on their trade, pangolins continue to be the most trafficked mammal in the world, sold for their meat and scales. As with any conservation story, the situation is highly complex, with embedded cultural beliefs fuelling the black market. This carer’s charge was extremely shy and it had taken him many moments of patience and round-the-clock care to gain its trust. A simple story of human kindness, this picture has now also featured in campaigns to raise awareness and support for the species. With increasing numbers of cars on the road, ‘One in a million’ by Morgan Heim chastises us to give a thought for the millions of animals that are killed every day and discarded as ‘roadkill’. Morgan Heim found this black-tailed doe, its eyes not yet dulled by death, on the road. 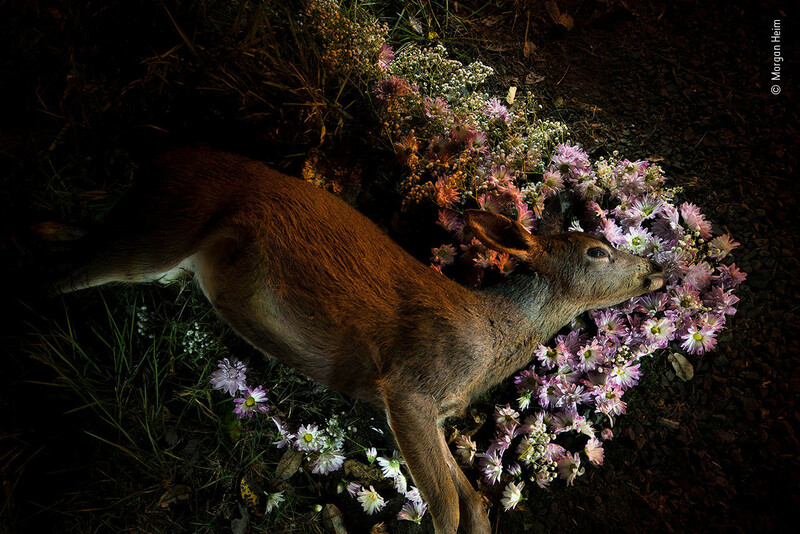 Returning at dusk, she brought flowers to arrange a funeral wreath around the deer as a roadside memorial. Animals subjected to road trauma are seen as an unfortunate by-product of our busy lives, yet if we drove a little slower, or built wildlife overpasses and tunnels into road schemes we could stop the needless slaughter and save lives. Using humour and surprise, ‘City Fisher’ by Felix Heintzenberg, gives us a more positive story of how we can live alongside wildlife. 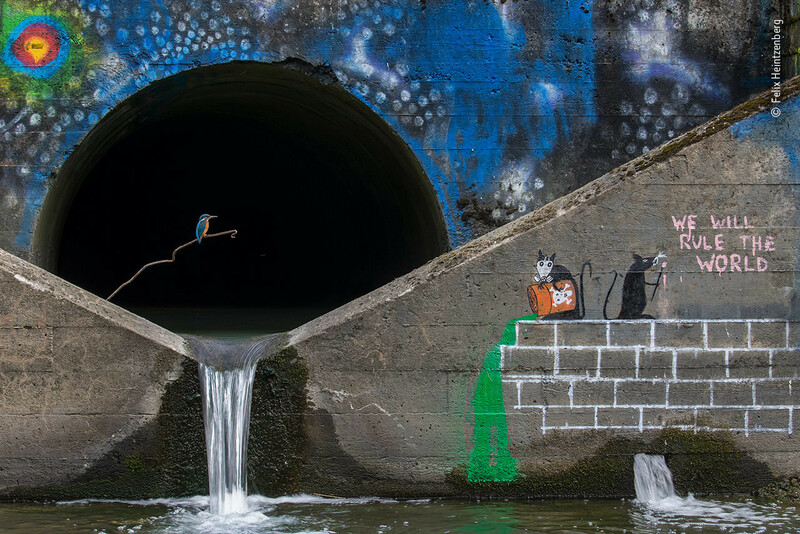 This urban scene, with its brilliant composition, tells shows how better water treatment and bans on pollutants in some cities, can result in kingfishers inhabiting urban areas. 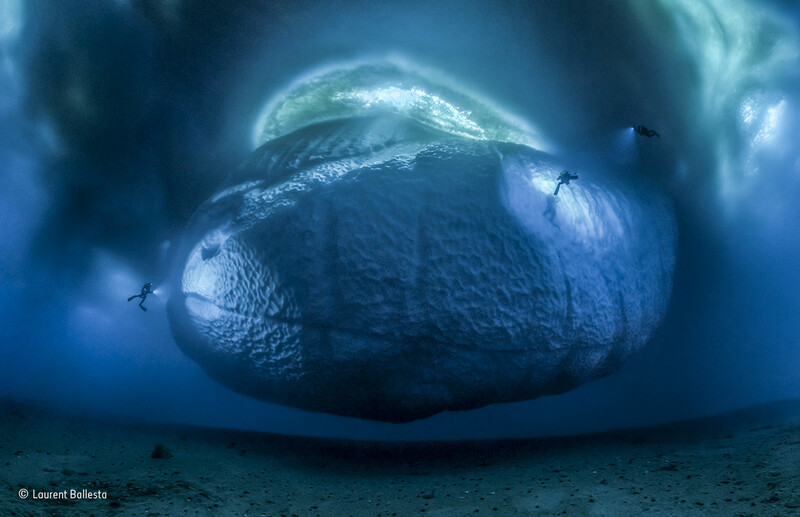 From the familiar to the unknown, ‘The Ice Monster’ by Laurent Ballesta reveals hidden worlds. A painstakingly difficult image to capture, the glowing lights, the human outline, and the contours of the ice are a feast for the eyes. Here we are privileged to see the unseen in all its wonder and glory thanks to the skills of the photographer. And, finally, from the sublime to the bizzare. Blood Thirsty by Thomas P Peschak captures a rarely seen and fascinating behaviour. Known as the vampire finch, these sharp beaked ground finches normally feed on seeds and insects, but such things can often be in short supply on their home on Wolf Island, a remote part of the Galápagos Islands. 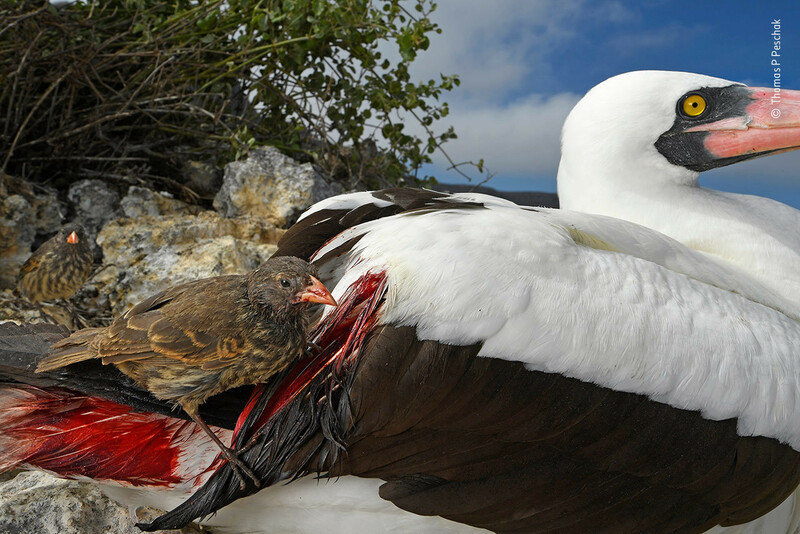 To supplement its diet, the vampire finch has evolved to drink the blood of the Nazca booby. Does this vivid image of this unusual behaviour evoke revulsion or does it prompt us to ask what extreme would we would go to survive? Exposing the natural world in all its facets defines the ethos of the Wildlife Photographer of the Year. Should we continue to showcase the aesthetic beauty of nature? Absolutely. But we will never shy away from the uncomfortable truth of the realities of the natural world or its perilous state. WPY will continue to give a platform to the work of passionate and talented photographers all over the world who can bring us these stories on behalf of animals and ecosystems in need of our attention and our compassion.